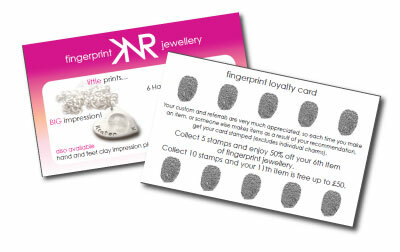 Unique to KNR Jewellery is your very own loyalty card! Kirstie appreciates your custom and referrals are important to her so she wants to reward you for this. Each fingerprint item you have made, excluding individual charms, earns you a stamp on your card. If you then recommend me to friends, and they have fingerprint items made, you earn another stamp and so on. Once you have collected 5 stamps, your 6th item is half price and after 10 stamps your 11th item is free up to £50. Get your Christmas, Christening or Mother’s/Father’s day presents organised in one stress free visit and you may even get enough to treat yourself for free! Call 01295 271051 or 07967 399449 to make your fingerprint appointment, visit us at an event (see events page) or why not get your jewellery made for free and host a fingerprint party (see fingerprint party page)!